This vegetable production guide is intended for the NJ commercial vegetable grower who has to make numerous managerial decisions. 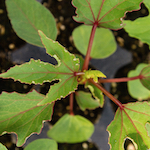 Although the proper choice of the variety, application, pesticide, equipment, fertilizer, and cultural practice is the individual vegetable grower’s responsibility, it is intended that these recommendations will facilitate decision-making. Download complete guide or download by section and crop. is NOT for home gardener use. The product label is a legally binding contract between the user and the manufacturer. The user must follow all rates and restrictions as per label directions. The use of any pesticide inconsistent with the label directions is a violation of Federal law. Collaborative, multi-state Cooperative Extension programming for Northeastern US growers on production and marketing of ethnic vegetables and herbs has resulted in increased fresh produce availability for urban immigrant communities. The World Crops website provides information on the crops evaluated and introduced. 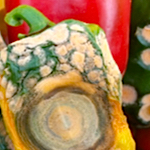 This free publication, targeted to New Jersey and the surrounding mid-Atlantic region, helps commercial vegetable growers understand and manage potential fungicide resistance development on their farm. 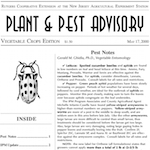 The Vegetable Crops Edition of the Plant & Pest Advisory provides seasonal updates on insects, diseases, and weeds impacting New Jersey. Disease forecasting notes are also available.